Tomb of St. Roch in Venice. 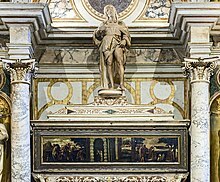 Saint Roch or Rocco (c. 1295 – c. 16 August 1327) was a Christian saint. His death is commemorated on 16 August. He a patron saint against the plague. He is also a patron Saint of dogs and falsely accused people. According to his legends, Roch was born in 1295 in Montpellier, France. He was born with a red cross on his chest. His family was prosperous. As a young man he was very religious. He decided to live the life of a hermit. He gave away all he owned to the poor. At age 20 he set out on a religious pilgrimage to Rome. At this same time the plague struck Italy. While in Italy he stopped in villages to take care of the sick. Apparently everyone he tended to got well. He finished his pilgrimage to Rome. On his return trip he was struck by the plague himself. He decided to take refuge in the forest alone and wait for his death. According to his legend he was visited by an angel and was healed. A dog was said to have brought him bread every day. He then set out for Montpellier. His legends do not agree on what happened next. In one version he returned to Montpellier and died there. Another version say he returned to France but was arrested as a spy. He remained in prison for the rest of his life. There is little historical evidence for the existence of Saint Roch. He remains one of the most popular saints in the south of France. His feast day is on August 16th. This page was last changed on 3 July 2016, at 06:59.